The Road Less Travelled: YOU can make a difference! 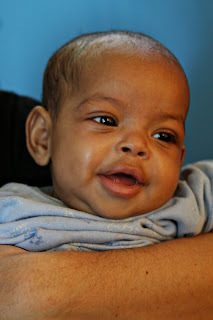 While we were in Ethiopia we met the children at House of Hope waiting for their families. This precious little girl is Elliana Hope-Zinash Williams she was one that we were not only able to hold and love on but we took pictures for her family. Isn't she sweet? Even sweeter in person, I promise. She is a sweet sweet little girl who is incredibly loved by her family. Today her family found out that they need to be in Ethiopia a full ten days sooner then they thought. This is GREAT news in regards to being able to hold their precious baby sooner. However its not so cool in the financial department. The tickets have been booked, they were prepping to leave, things were going smoothly. Today with this change they have been hit with change fees and airfare increases on their plane tickets. These are not small fees. The travel agent they used has already reduced these fees as much as they possibly can. The funds they needed to complete the adoption have been met in an already super natural way by our Heavenly Father and they continue to trust HIM to provide. Hearing Shannon's voice today on the phone and knowing how much this was killing her I knew we had to help. YOU can too. Below is a paypal link directly to Saxon and Shannon's paypal account. Shannon has added one to her blog as well. If you can't donate would you consider spreading the word on your blog? Facebook? Twitter? The Williams need $1,000 in the next 24 hours to be able to pay for these changes for airfare and lodging. Thats nothing! God calls us to help one another and to care for orphans, this is one awesome way you can take part in bringing little Elliana home. This is SO doable. Can you give $5? $10? Even $20 or more? I know God will provide and I'm thrilled to be able to support adoptive families and while this comes as a surprise to Saxon and Shannon this does NOT surprise our King. I am overwhelmed by your kindness, Erica. Thank you for your faith. We are excited to be on this journey and believe God will continue to make a way for us. THANK YOU! THANK YOU! THANK YOU! Hope you are able to collect all that you need, we could only give a little but a little adds up! posted on facebook and donated a little bit...wish I could do more!